Terri began spinning in 2004 and quickly developed a passion for her hobby. 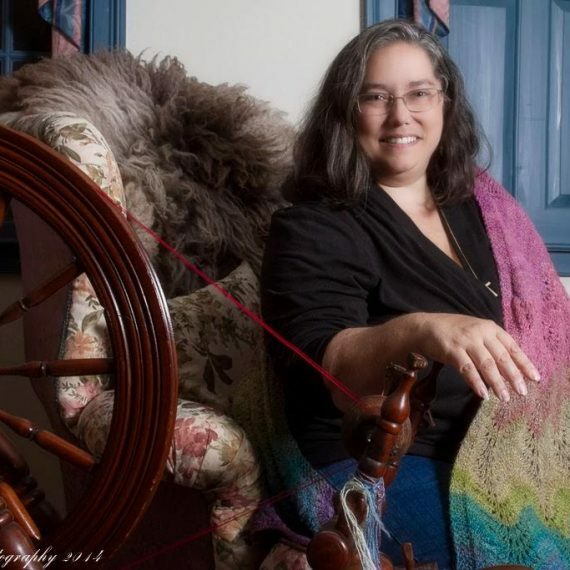 From the beginning, she has demonstrated spinning and other fiber arts in a variety of different settings, (from living history events, schools, farm days, and fairs to local yarn shops, guilds [spinning and quilting], etc.) and is always happy to share her knowledge. As a result of her involvement, she was selected to be a SOAR (Interweave Press’ Spin-Off Autumn Retreat) Scholar in 2011. Terri has earned many awards in Skein and Garment Competitions, including, but not limited to, Massachusetts Sheep and Woolcraft Festival, The New York Sheep and Wool Festival in Rhinebeck, and the Eastern States Exposition. She has also earned Awards from the Northeast Handspinners’ Association and the Handweavers’ Guild of America. Terri has published articles in Wheel, Ply, and Spin-Off Magazines and blog posts in Spinning Daily.